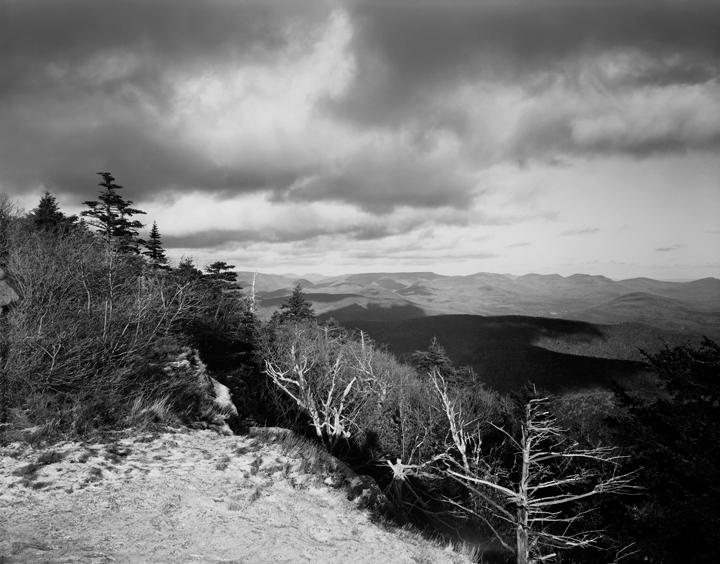 The culmination of a very long, hard climb on a bone-chilling, dry January day, this image made in 2000, is a portrait of the highest point on Wittenberg Mountain, one of the most dramatic and inaccessible peaks in the Catskills. Although many hikers may disagree with my use of the term “inaccessible” (in truth, it’s not that hard of a climb), it was to us that day. I was accompanied by my friend Ed and dog Jenny. From the parking area, Ed and I crossed the swinging bridge spanning a small creek that leads to the trail head, while Jenny opted to wade the creek. We met at the trail head and marveled at Jenny’s completely stiff, frozen hair. The result of a 5 second immersion in water at 18 degrees fahrenheit. She, in typical fashion, shrugged it off as she flew up the trail ahead of us. Ed and I were moving slower however. At this point in 2000, I was still using my beloved 1972 Burke and James 8×10 inch view camera that sat on a Ries wooden tripod capable on supporting cameras as big as 7×17 inches (film size). Both are now relegated to backup duty because I cannot climb with them on my back. Ansel Adams and Edward Weston both used the same tripod. Its weight combined with the rest of the equipment (plus lunch, water and extra clothing) reached an intolerable 65 pounds. Thus, in 18 degree air, I ferried such a load that within ten minutes I had stripped down to a T-shirt and still soaked it with sweat! The rest of the trip to the summit was a slog occasionally interrupted by a fast downward slide on thin snow-covered ice that brought me painfully to my knees. We reached the summit forest of fragrant balsam and red spruce at lunch time. Within seconds of stopping for a drink of water, we froze in our wet shirts and scrambled for more clothing. Now suddenly we could not get warm! The physical effort had ceased and our bodies were depleted. A quick lunch and warm drink helped but not for long. To add insult to injury a gentle breeze began to wash the summit adding windchill to our problems. I now worked quickly to find my intended image; determined not to freeze on this mountain. The trail lead us to a small clearing with a view facing northeast. High wind clouds dark with moisture began to move in from the southwest. My dog, dry and fed, was shivering from inactivity. I spotted a cliff edge with dead spruce trees leading to a verdant carpet of mountains spread before me. A small spruce crown topped the display. I was ready to work. As quickly as possible, I set up and made the image shown here. Calling it quits was easy. We packed and left having spent all of this energy to make one negative! I did not print this image until an exhibition called for it in 2004. I only print this photograph in large sizes such as 28×35 inches or larger. It doesn’t translate what I felt that day in smaller size. The huge expanse of mountain and sky, shadow and sunlight. The Catskill Mountains in a cold, clear alpine moment. A moment and a day I will never forget.